Notifications when hard drive space is low. Is there a better alternative to Disk Alarm? Is Disk Alarm really the best app in File Management category? Will Disk Alarm work good on macOS 10.13.4? Mac OS X tells you when your hard drive is full, but, generally, it's already too late to react. NEW: Fully Compatible with OS X 10.10 Yosemite and its Dark Menu Bar! NEW: Showing a badge in the Icon with the total free space. 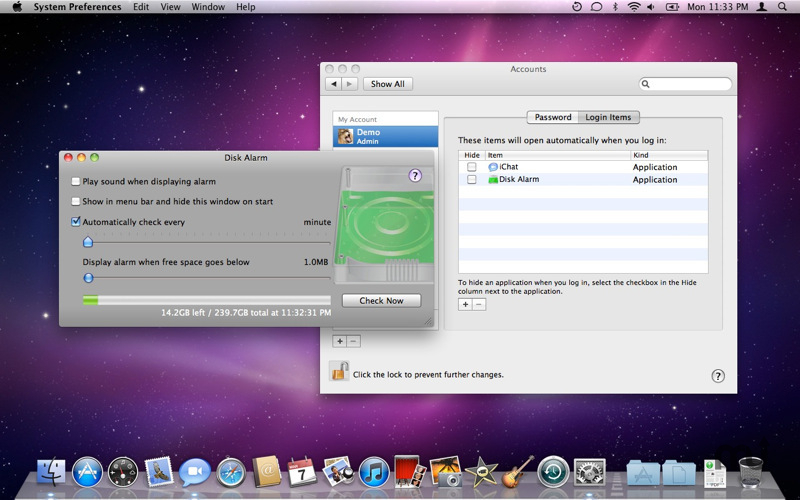 NEW: Disk Alarm is now a Sandboxed App, being a better citizen on OS X. Disk Alarm needs a rating. Be the first to rate this app and get the discussion started! FIXED: Going to Full Screen when trying to close the Window - not anymore! FIXED: Send E-mail checkbox now de-activated when no volumes are checked. FIXED: Version 2.0 wasn't starting because of bad signatures on our side. Sorry. Fixed.